Saturday night is curry night! And, more often then not these days it’s Veggie curry night, and I thought it would be good to try some new variations and maybe find some new favourites. So…. 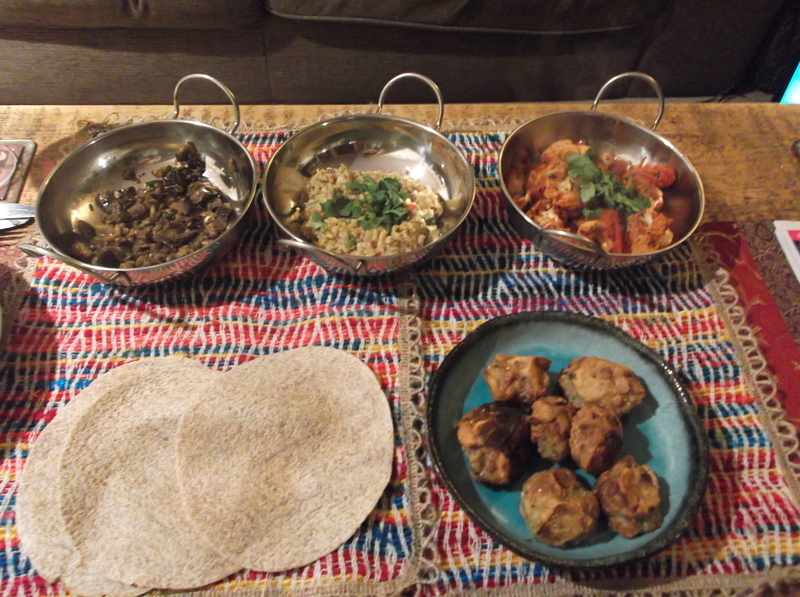 From left to right we have Aubergine & Onion, 4 lentil dal, Cauliflower & Tomato, Potato Bondas and some wholewheat chapattis. They were all good, and the aubergine and potato will definately be served up again. The aubergine was, in fact, a revelation- it didn’t look particularly lovely but was so spicy and tasty that we finished the lot. Here’s the recipes for the 2 veggie superstars. heat the oil and fry the onion until soft. Add the garlic and chilli and cook for 2 mins. add the cumin seeds, coriander and turmeric and mix together. Add the aubergine and mix together until the aubergine is coated in the spicy onion mixture. add some water- up to about half way up the aubergine. Not too much as you can always add a little more if it starts to look a bit dry. stir through the garam masala. cook for 20 mins until the aubergine is soft and brown. I did this in the over, covered in foil, as the oven was already on. I would really recommend you try this as it was lovely, despite not looking particularly yummy! It goes so well with the chapatti. mix all the ingredients from the flour down together, adding some water a little bit at a time until you make a thick batter. mix all the rest of the ingredients together well and mould into small balls. heat some oil in a frying pan. Dip the balls in the batter and fry on all sides until nicely browned. Colin really liked these and they did not last long on the plate! We both enjoy having these small plates where you can try a little of several different flavours. This, however, is not the same case when we order a takeaway- habit I guess! Here’s to a restful and yummy weeks holiday in the French Thomas household. Sounds to coin a phrase Yummy! !